Some heroes walk. That's the message behind Walk So Kids Can Talk, an annual event presented by BMO in support of Kids Help Phone. This Sunday, May 3, thousands of people across Canada laced up their sneakers and took part in a 5km walk. Here in Fredericton, the Varsity Reds track and field and cross country teams were out in full force to do their part as well. In addition to the walk, there were activities, a BBQ and cake for everyone to enjoy in the sunshine of Wilmot Park. There was even an obstacle course set up for young and old to try, filled with equipment brought up from Saint John by Varsity Red Clayton Holteen. "The course consisted of most of the main components of our track team - running, jumping and throwing," said V-Red Katie Wallace. "It began with jumping hurdles; running zigzagged through cones; throwing an object like a beanbag, a small discus or a children's javelin; running back and finishing off with a long jump!" "I think kids enjoyed the course as a whole," Holteen added. "Our goal was not to make anything too difficult. We just wanted the kids to be able to move around a lot and have fun with their friends. It only seemed fitting that we tried to make an activity that required kids to interact with each other when that's what the Kids Help Phone is all about - peer support." Holteen says when the request came out for support from the Varsity Reds, getting involved was a no-brainer. "As a kid, I experienced first-hand what it means like to feel scared and alone. But I also came to understand how having someone there for you can provide emotional support and warmth in even the loneliest of moments. The message the Kids Help Phone gets out there is that of community support and to show that even though you may feel like it, no one is ever truly alone. Because of that, the moment the message went out to the V-Reds to come out and support this function, there was no way I could refuse." Wallace says the best part of the day was seeing so many families and children from the community out in the park, taking the time to get involved in such an important cause. 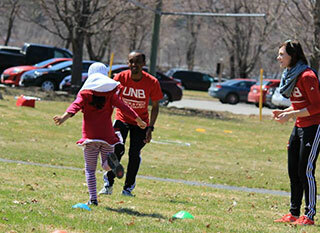 "It was awesome seeing the kids being active, enjoying the sun, laughing - and all for a good cause. Even some parents got into the obstacle course, some even piggy backing their way across the finish!" More than 40 communities across Canada got involved to help raise awareness and money. The six communities in the Maritimes raised $24,000. Kids Help Phone offers around-the-clock counselling for young people. Since its inception in 1989, it has received over 7 million phone calls.